INJURY? ACCIDENT? CONTACT US TODAY FOR AN APPOINTMENT! Sign-up using the form or call us at 701-237-5150 to make your appointment today! Comparisons between the inner world and the outer world have been frequently drawn by philosophers, nature writers, and visual artists. For example, "seeing the universe in a grain of sand" is a well-known aphorism. The number of neurons in your brain has been compared to the number of stars in the Milky Way. The golden ratio (1.618), derived from the Fibonacci sequence, is demonstrated in flower petals, pine cones, nautilus shells, and human DNA. In this same manner, another comparison may be made between wildfires and our internal system of fires known as inflammatory processes. These inflammatory processes are unleashed by the immune system in response to a real or perceived attack by foreign cells and foreign proteins. This response includes destroying cells that are recognized as "non-self," such as microbes but including malignant cells and virus infected cells. Additionally, the immune response involves the release of cell signaling molecules (cytokines) that facilitate cell-to-cell communication. This signaling network modulates the immune response, heightening or diminishing the course of inflammation as needed. Problematically, certain inflammatory processes may be extended unnecessarily or inappropriately, as in anaphylactic shock. Such out-of-control inflammation may be likened to destructive forest wildfires. Inflammatory processes may also affect joints of the neck, low back, hip, knee, and ankle. Inflammation of a joint is termed osteoarthritis, a painful disorder which also may cause redness, increased warmth, and swelling. Joints affected by osteoarthritis tend to develop limited mobility and use of these structures may become quite difficult over time owing to pain and decreased motion. Osteoarthritis is not necessarily abnormal and may occur as a result of daily physiological weight-bearing forces. But, as osteoarthritis may cause pain and debility, we could and should employ preventive measures to counter these degenerative processes (processes involving breakdown of tissues). One of the most effective proactive and protective methods to prevent or delay the onset of osteoarthritis is regular vigorous exercise. Physical activities including walking, running, biking, and strength training teach the body how to handle mechanical loads. 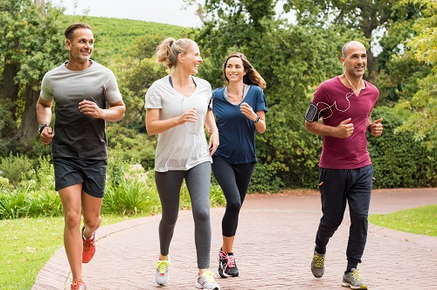 By training the musculoskeletal system and other connective tissues, physical activity helps to build up "resistance," in a sense, to the degenerative forces of osteoarthritis. In this way, regular vigorous physical activity helps us to continue to be healthy and well over the course of a lifetime. Additionally, regular chiropractic care supports our long-range goals of vibrant good health. Regular chiropractic care helps our nerve system to be free of interference and function at peak levels of performance, and helps to optimize our spinal mechanics. By providing these benefits, regular chiropractic care helps us get the most out of the time we spend exercising and achieve greater good health today and into the future.